There is still time to join in here. 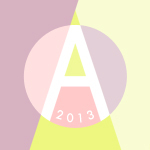 You can also see all the fab images using the hashtag #augustbreak2013 on instagram, facebook, twitter and pinterest! Love this photo. Love the color and the rust and the circles. Great!